Sprouting Grains, Beans, and Seeds: Is It Healthy? Phytic acid, a noted antinutrient that binds minerals and can lead to mineral deficiency, is found within the hulls of many types of grains as well as legumes of various types (1). Although sprouting does reduce the presence of phytic acid, it's still present. A number of other antinutrients are also found in grains. Sprouting Grains and Grasses - What's So Bad About Them? What is a sprouted grain? It's essentially an immature form of a mature grain, and it's likely to convey at least some of the harm the mature ones do. Most grains contain addictive opioids. Wheat, for instance, has been found to contain at least 15 opioid peptides (2). In human and animal studies they've shown the ability to cross the blood-brain barrier and affect the central nervous system, which has the potential to alter our mood, perception, cognition and behavior (3). There's reason to believe that this interaction may play a part in the development of schizophrenia (4) as well as other mental disorders. Grains are pretty much a weaker version of a narcotic drug. Have you ever heard someone say they're desperately craving bread? It's entirely possible they're literally going through withdrawal because their brain is no longer getting its opioid fix. On a personal note, removing grains was the largest factor in overcoming my colitis, which plagued me for years. I see no good reason to go anywhere near grains, sprouted or otherwise, and so I avoid them. All the varieties of sprouted grasses - which are related to grains - I've tasted have been revolting and so I don't touch them either. Sprouting Grains, Seeds, and Beans: So What About Beans and Other Legumes? The blasts of air out of your rear should tell you pretty quickly your body does not digest sprouted legumes much better than it does whole beans or lentils. Most legumes require cooking to be digestible, which should give you a hint about them. Even when they're cooked they often putrefy in our digestive systems and cause gas. Humans lack the ability to produce large-quantities of the starch-digestive enzymes known as amylases needed to break them down in an efficient manner. Their high protein levels also cause digestive problems. I'd say that's a pretty good reason to avoid legume sprouts, but I don't think it's a major health concern if included in the diet occasionally. Sprouting Grains, Seeds, And Bean: What About Seeds and Nuts? Sprouted nuts and seeds are probably the best choices in the sprouts category. They tend to carry the high fat content of the nuts and seeds they come from, however, which may effect your diet. Eaten on occasion they shouldn't cause any problems. 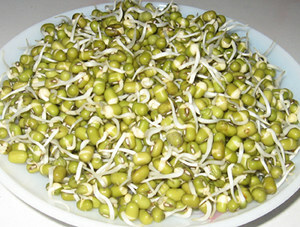 Sprouting Grains, Seeds, and Beans: But What About the Nutrients in Those Sprouts? Sprouted foods are frequently touted as nutrient powerhouses, and sprouting certainly does increase concentrations of certain nutrients over a food's non-sprouted version. None appear unusually high in anything valuable, however. I've compared nutrient data for sprouted and cooked lentils, sprouted wheat (wheat grass) and sprouted Alfalfa to everyday spinach below. Sprouting Grains, Beans, and Seeds: What To Do? Seeing numerous ways they could be contributing to ill health and no reasons why they're necessary, I don't see any compelling reason to eat sprouts. If you eat them, I suggest you do eat them only ocassionally and choose sprouted nuts and seeds instead of sprouted legumes and grains. Learn how sprouting grains and other food fits within the context of a healthy raw diet. Learn what foods are ideal and not so ideal here. 1) Committee on Food Protection, Food and Nutrition Board, National Research Council (1973). "Phytates". Toxicants Occurring Naturally in Foods. National Academy of Sciences. pp. 363–371. ISBN 9780309021173.
gluten: their isolation and characterization. FEBS Lett 296: 107-111. 3) Zagon IS and McLaughlin PJ (1991) Brain Res. "Identification of opioid peptides regulating proliferation of neurons and glia in the developing nervous system."